Liked it better than Unholy Three because of the super fast pace and more exciting atmosphere, the wonderfully (if not accurately) rendered African setting. Lon Chaney is great as Dead Legs, but the great Lionel Barrymore looked pretty generic to me, failed to stand out as the arch-rival. Young wife Anna quit acting the following year (right before sound films) and lived until 1986. 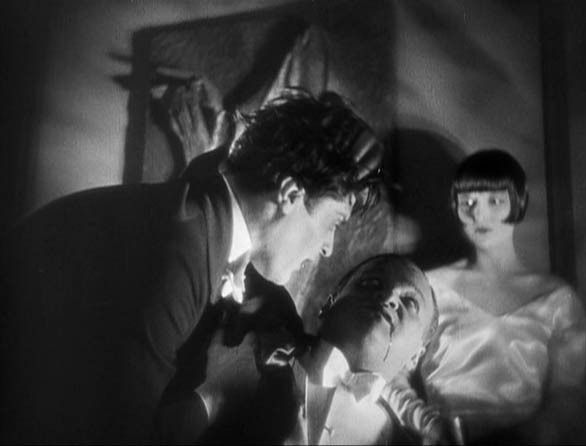 Drunken Doc, who falls in love with the daughter, was Warner Baxter, who won the best-actor oscar that same year in the second annual academy awards, for In Old Arizona, the first full-talkie. Not to be confused with the 50’s British Ealing Studios West of Zanzibar about a good-hearted man (Story of O actor Anthony Steel with wife Sheila Sim of A Canterbury Tale) fighting ivory pirates. A good movie, watched with Katy and the solo piano score. Very “modern” story of Louise “Lulu” Brooks with her bobbed black hair and grinning sexuality and the trouble she causes all the men in her life. Lulu’s gonna marry Dr. Scho(e)n, but his son Alwa is secretly in love with her… as are Lulu’s former pimp (?) Schigolch, the first lesbian character in film history Countess Anna, and even at the end Jack The Ripper. Hilarity doesn’t exactly ensue… Lulu stays semi-oblivious as the situation gets worse. She gets Schon in trouble at the opening of her own big stage show, causing the cancellation of his wedding and the fight that leads to his death at Lulu’s hands. Alwa grieves his father for all of a minute before grabbing Lulu and running off to hide, taking Schigolch (a drunken load) along for the ride. 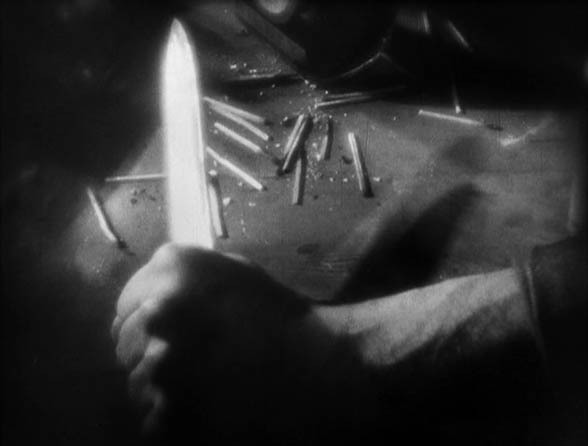 They end up destitute with Lulu cheerfully offering herself to a serial killer by the end. 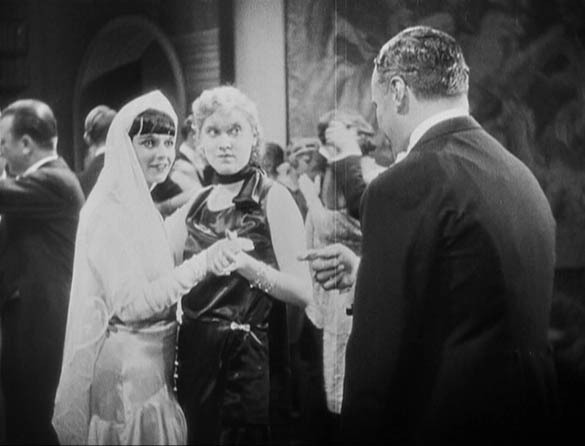 Louise Brooks is electrifying, and the film looks terrific and kept our attention easily. Great piano score, more interesting and complex than the little sound sample on the menu would imply. The rare Criterion-issued film that is more interesting from a star perspective than a director/filmmaking one… everyone then and now has been more concerned with Louise Brooks as/is Lulu than anything else. Buster Keaton’s first film for MGM, and “first film BK made with a prepared script”. Silent. Unbelievably highly rated considering how lame it seemed to me. Keaton costars with Marceline Day (60+ movies in a decade, stopped acting in ’33, lived till 2000). This is only a year after Sherlock Jr., The General and College, and just a few years before his career had completely devolved into junk like What, No Beer?. The beginning of the end for Buster! So he “acts” in this one… he has facial reactions, falls in love, looks angry and sad and everything. No more blank faced humor. Scene in a pool changing room that was so long and obvious I started looking at the records on the wall instead of the movie. All sorts of trouble. Keaton is a “tintype” photographer, charging for portraits on the street, when he meets M. Day. He follows her to the newsreel office where she works, trades in the tintype for an expensive (for him) ol’ beat-up movie camera. Tries to be johnny on the spot with the news, but can’t compete with the big fellas. So Day gives Buster a tip on the Chinatown riots, which Buster covers himself in the only great scene… putting himself in mortal danger with his accidentally acquired new pet monkey sometimes running the camera, making it all the funnier when the news fellas later see the footage and declare it the best camera work they’d ever seen. But first Buster has to be sadly disgraced and lose his girl to a showoffy strongman then he has to disgrace the strongman via a daring speedboat rescue, regaining the girl and securing a job at the news place. And everyone is happy except for the strongman (no girl, probably no job) and me (only two funny scenes, Buster losing his distinctive personality with no apparent gains). Not a waste of time or anything, don’t recommend against it, just sorta personally disappointing. Watched the German version with orchestral score. Movie made me feel ten feet tall, with wings. Score is nothing to worry about, I turned the volume down… will have to try the harp score next time. Brilliant, full of harsh angles and crazed effects and loopy overacting. Presence! The movie booms with exclamation points! Guy Maddin must love it. 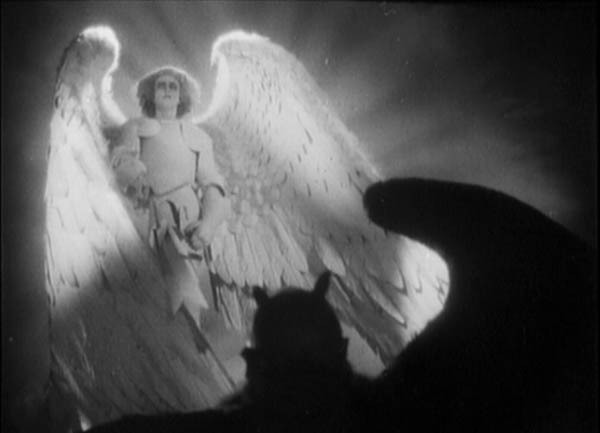 An angel stupidly bets the devil (err, Emil Jannings as Mephisto) that he can’t corrupt humanitarian scientist Faust (a swedish actor who died of pneumonia in the late 30’s), with the world at stake. Emil first brings a badass plague, then allows Faust the power to cure a few people to make him feel like he’s all good. Then, the devil offers Faust youth so he can lust after some very white young woman (Camilla Horn, who acted through the late 80’s). 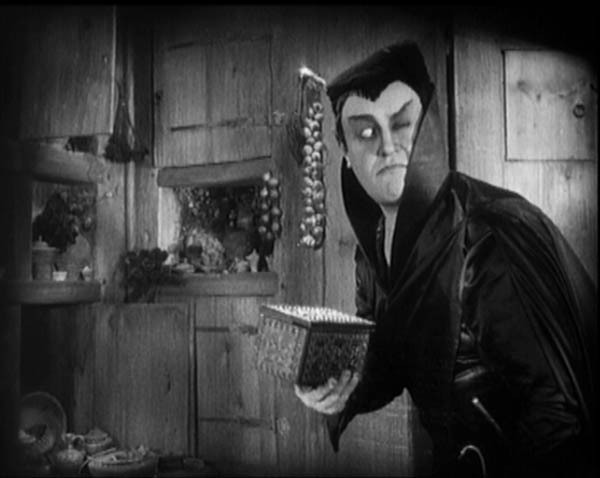 Faust never really gets the girl, though he sleeps with her once… then is blamed for killing her brother and flees on his magic carpet. The girl’s mother dies, she’s put in the stocks, has a baby, loses it homeless in the snow because nobody will help her, then is burned at the stake accused of killing her own child. 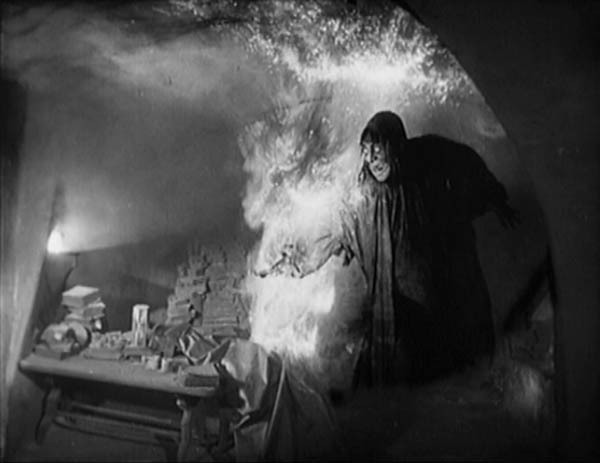 Faust hears her cry for help at the last minute, holds her and they die in the fire together. Faust goes straight to hell but for some reason the world is saved? Emil is awesomely sinister. Movie is a visual delight, a story well told, everything a movie should be. Will have to check out the commentary, the harp score, the export version, etc etc. Watched the four-hour TCM reconstructed version over a few days. Liked it pretty well. Excellent intro to McTeague’s character: finds an injured bird while mining and picks it up… another miner knocks it out of his hand, so McTeague hurls the guy down a hill. Oh, and the slang between McTeague and Marcus is fun. The elderly neighbors and junk dealers provide nice counterpoints to McTeague’s relationship with his wife, and the movie keeps coming back to the heavy-handed theme of greed. I’d wondered if it had just been a four-hour movie in 1924 that Stroheim had edited himself whether anyone would talk about it half as much today. Is it THAT important a film, or is the fact that most of the footage was destroyed by the studio the thing that makes it important? Anyway, cool movie, glad I saw it. Not quite as nice as Sunrise (but what is?) and the story’s a bit of a bummer. Appropriate ending, anyway (and nicely tinted desert scenes).